Recently XGBoost project released a package on github where it is included interface to scala, java and spark (more info at this link). I would like to run xgboost on a big set of data. Unfortunately the integration of XGBoost and PySpark is not yet released, so I was forced to do this integration in Scala Language. 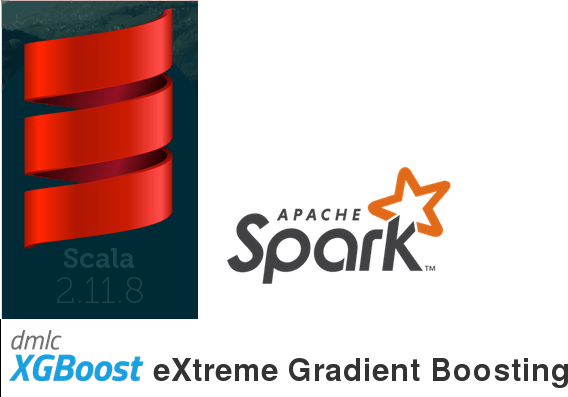 In this post I just report the scala code lines which can be useful to run spark and xgboost. In a further post I’m going to show the software setup and the integration of this project in Itellij IDEA community edition IDE. We need to prepare the directory where we will write our results. The results will be saved in parquet format. The data I’m using as test are the one of the Kaggle Bosch competition. // Split the data into training and test sets (30% held out for testing). We store the prediction on validation set, since we will use them to tune the metric for this competition. and prepare the submission file. I m a beginner to bigdata…can you please help me in this how to start and what i have to refer. If possible please share me the Git-hubs and any links videos etc.